In preparation for some exploration of funding sources for roads, it helps to see what the situation is with the jurisdictions and types of roads, for mileage and VMT. Jurisdiction means the level of government responsible for the road. This is not always clear from simply looking at a road. If there is a federal or state highway sign, it is pretty clear, but there are roads that are part of the state highway system that are not signed as such. The types of roads, here, means functional classification, which is a federal designation of Interstate, Principal Arterial – Other Freeways and Expressways, Principal Arterial – Other, Minor Arterial, Major Collector, Minor Collector, and Local. Again, it is not always easy to distinguish classification, but as a generality, freeways fall into the first two, major roads such as Folsom Blvd and Watt Ave fall into the third, busy wide streets are the next three, and residential streets are the last. Another useful classification is that the first six categories are roads, meant to move motor vehicle traffic, and the last is a street, meant to provide access to residences and small businesses. Unfortunately, we build far too many of the road variety and then put business on them so they no longer function well to move cars. See Strong Towns for a more detailed explanation of roads, streets, and stroads. This week’s Sacramento News and Review (Thursday, April 29, 2012) has a feature story titled “Onward, Sprawl,” highlighting the impacts of the passion for growth of Sacramento County, Folsom, Rancho Cordova, and Elk Grove. I highly recommend a read. The Sacramento Bee has a short article in the Wednesday, April 18 edition titled “County kicks off plan for Hwy 16 growth,” yet another area for development east and south of the developed area of the county. It will be impossible to serve these new developments with a functional transit system. 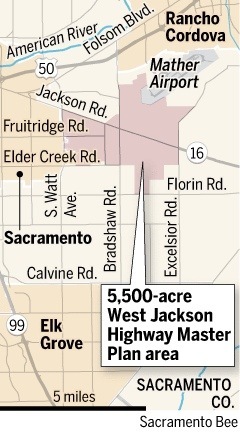 RT is already not able to serve the sprawling suburbs of Sacramento county, and these developments are much further out from the central cores that contains most of the jobs in this area. Neither light rail nor bus service works when the distances are great and the ridership small, as it would be for these far-flung areas. Driving will increase, more and wider roads will be needed, traffic will be induced, and those people looking for respite from an auto-dominated landscape will feel a need to move even further out, to get away from it all.